Pathfinder's response to the release of Dungeons & Dragons Next is a three-pronged attack. With Dungeons & Dragons Next releasing this summer, top competitor and spawn of 3.5 edition Pathfinder doesn't plan to sit idly by and let Wizards of the Coast hog all the spotlight. Speaking with ICv2, Paizo Publisher Erik Mona detailed the company's three-part plan to tackle the giant. 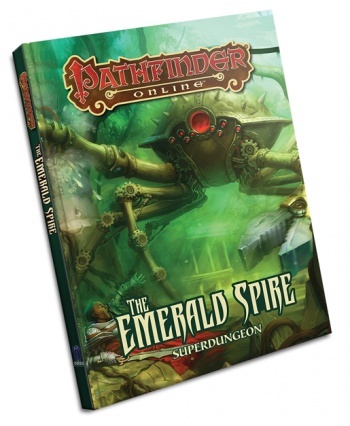 The first part involves releasing The Emerald Spire Superdungeon in June, a 160-page hard cover dungeon module with 16 levels, each designed by veteran game designers, including Keith Baker and Ed Greenwood. Part two comes in August in the form of the Pathfinder Advanced Class Guide, a hardcover rules expansion that will introduce ten new classes to the game, and the final part is the August release of the Iron Gods Adventure Path, a campaign setting that blends elements of sci-fi and fantasy. Scott Thorne, owner of the largest game store in southern Illinois, weighed in on this plan in his weekly column on ICv2, suggesting that releasing two books targeted for gamemasters may not be an optimal strategy. Thorne says that modules and other books oriented for gamemasters typically sell four to six times less than those targeted to players. Given that's roughly the ratio of players to gamemasters, the math adds up. Still, Pathfinder isn't likely trying to compete head-to-head with Dungeons & Dragons Next; it's just making its presence known and biding its time. After all, it was the fallout of 4th Edition that resulted in the rise of Pathfinder. Mona acknowledged that Wizards of the Coast has the funds and the brand recognition to market itself extensively, and actually hopes that the company is successful in bringing new players to the hobby - evidently, with the intent of converting them. "I, and most stores, have almost never had a new customer come into the store asking for Pathfinder," Thorne writes. "The Pathfinder RPG is almost unknown to the wider market." Pathfinder knows it can't compete with 30 years of brand recognition - and it won't. It'll let Wizards of the Coast do all the heavy lifting, then swoop in with a robust lineup of products for those who have gotten a taste and are looking for more. Clever.